Sony Music Nashville, home to country music recording artists such as Chris Young, Jerrod Niemann and Tyler Farr, was looking for a unique album drop promotional campaign to stand out and grab attention. Alliance Connection was tapped to create an unparalleled music experience and promotion. Sandals Resorts' was interested in building awareness around their recently renamed and renovated Ochi Beach Resort. Alliance Connection saw an opportunity to meet both companies' objectives by focusing on a highly travelled holiday weekend, Memorial Day, to create a distinctly American experience... in Jamaica! Alliance Connection was founded on the principle of saving companies both time and money through media and service exchange, so that's where we started. We built upon our record label launch model that was 100% cross promotional, supported by a comprehensive campaign concept and strategy that addressed creative, media, PR, production and sponsorships. 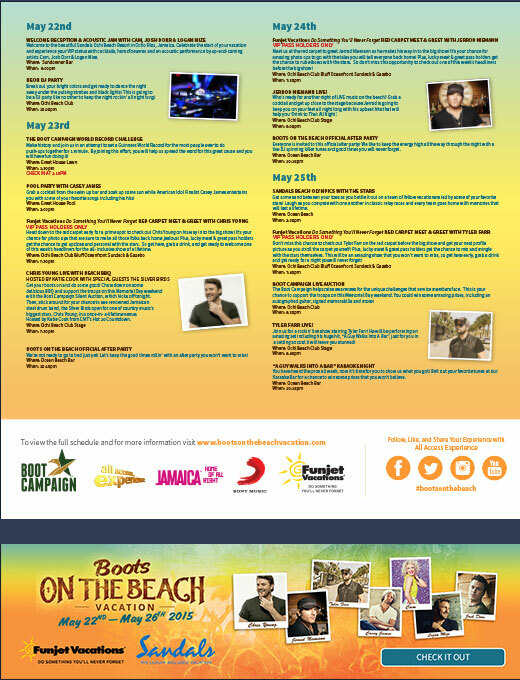 Our pre-event press and media outreach built buzz and excitement across radio, TV, print and online channels. Our press release was picked up by media channels reaching over 54 million and 67 radio stations. 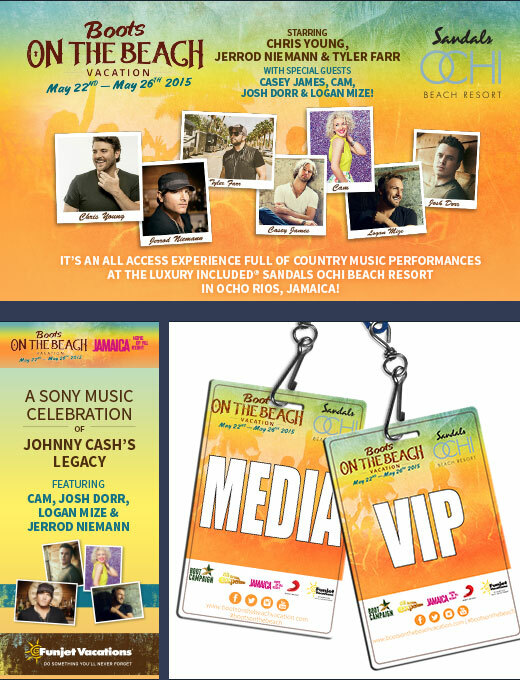 With Sony Music Nashville delivering the artists and Sandals Resorts providing airfare, accommodations and full access to their resort, we designed on-site marketing and produced and managed once-in-a-lifetime fan and guest experiences that included acoustic sets, DJ parties, live beach concerts, offsite excursions, and artist meet and greets. In light of the significance of Memorial Day, we added a fundraising element to raise awareness and drive donations to The Boot Campaign, a 501(c)(3) charitable organization supporting military families during- and post-service. Plus, the artists and media donated to the The Sandals Foundation Pack for a Purpose, providing school supplies to the children of Ocho Rios Jamaica. 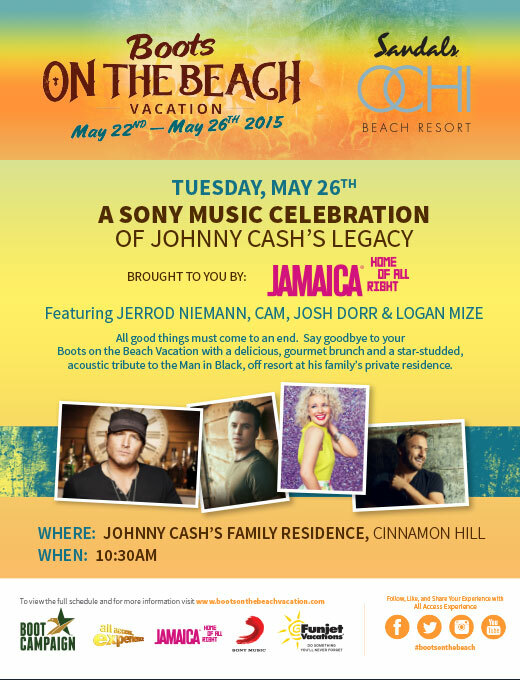 Sandals Resorts guests at Ochi Beach Resort Jamaica were treated to exclusive fan experiences from Sony Music Nashville artists Chris Young, Jerrod Neimann and Tyler Farr as part of the Boots on the Beach Campaign. Spotlight placement received 10,000 online impressions. Highlight video reached 10 million on YouTube channel, 12 million social followers and 6 million email subscribers.